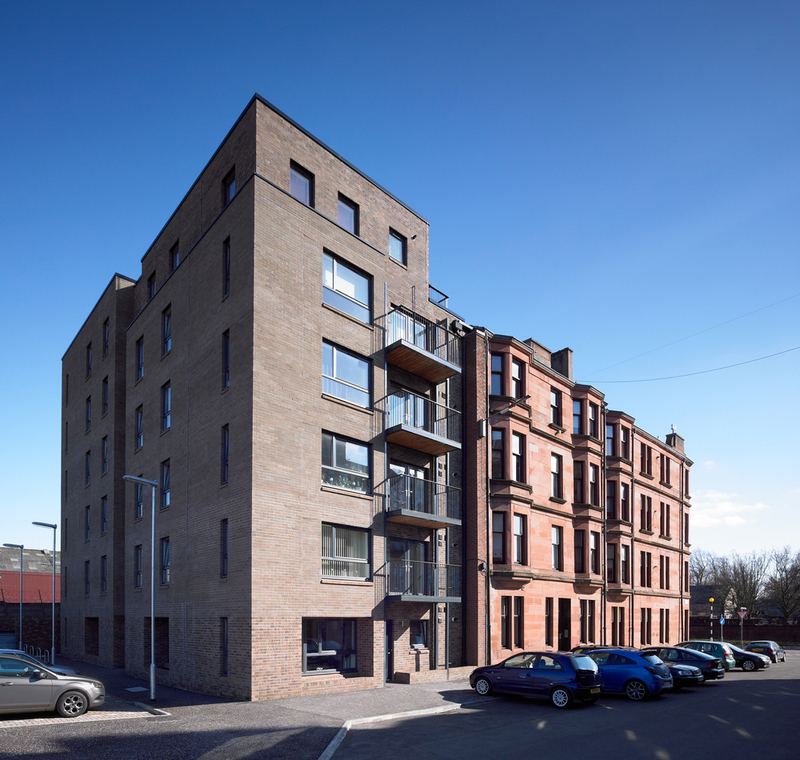 Trafalgar Court is the first new build development by Linthouse Housing Association in over 10 years, and creates 2 New bookends at Aboukir Street to provide 24 X 2 bedroom apartments, comprising 12 shared equity homes and 12 wheelchair accessible apartments for rent by Linthouse Housing Association. Balancing density with amenity was our first priority while tipping our hat to a historic map identifying an original and long lost Trafalgar Street, which ran East - West across Aboukir Street. We then made the decision to start with the traditional street pattern of tenements layout parallel to the street, then rotating these through 90 ̊, creating a new street frontage where once Trafalgar Street stood. This layout also permits possible future development to the North towards the River Clyde and to the East and West. The rotation of the blocks generates an East - West orientation, with a central vertical circulation separating a pair of flats on each landing, facing either East or West. Each flat has an outdoor balcony space and receives morning or evening sunlight, with upper level apartments receiving panoramic views across the city, and ground level flats with private main door access. Density and affordability were key drivers to make the project stack financially within social housing budgets and the resulting building is compact in plan and vertically dense. Intentionally simple and robust in material and detail the building envelope is of brick construction with well positioned and proportioned windows to carve out light and airy spaces internally. The brick was selected for it’s subtle sandy tones which sit comfortably next to the local blond and red sandstone, while the brick blend creates a visual depth and texture at ground level. The development was awarded Ecohomes Very Good rating, assisted by the credentials of facing brick, and is carefully specified using Green Guide A rated materials and practices, common practice now but often difficult on social housing budgets in dense urban sites. The project has successfully demonstrated the growing desire for shared equity housing with full occupation after completion, and has provided a foothold for young families to own a first stake in their first home, while Linthouse were confronted with a long waiting list for the rented properties which are wheelchair adaptable, and four of which have a private front door and small garden space. Ultimately the development has proven very popular with owners, tenants, the local community and our client.